A proxy for the strength of the trade winds in the North Pacific: nitrogen isotope records from three sediment cores off the west coast of North America (blue = 33oN, green =25oN , red = 24oN). More 15N is interpreted as stronger trades. From Deutsch et al. 2014. I am far from an expert on the ways in which this argument can break down or how this proxy is related to others, such as coral records. But this picture of the evolution of the tropical Pacific winds is consistent with direct surface pressure measurements. On time scales of seasons and longer, surface pressure is a very smooth field in the tropics, and the pressure difference across the basin in low latitudes is strongly correlated with the strength of the equatorial winds. Deutsch et al also provide the following figure, based on HadSLP2 (Allan and Ansell, 2006) and ERA40 (Uppala et al 2005) (yellow and cyan respectively), of the near equatorial difference in sea level pressure between the Indian Ocean/ western Pacific and the central/eastern Pacific. The black line is a 10 year running mean and an average over the two datasets where they overlap. The 15N proxy and the direct estimates of the equatorial east-west surface pressure gradient give the same qualitative picture, supporting the idea that the wind field variations are coherent and large scale enough that we can think of the proxy as a trade wind index. Of course the proxy then opens up the possibility for extending the record farther back in time. I was involved in a paper with GFDL colleagues (Vecchi et al 2006) in which we were looking at the slow downward pressure gradient trend as of 2005, before the extended strengthening trend in recent years became such a dominant part of the record. Zhang and Song 2006 independently focused on the same downward trend at the same time. We felt that we could attribute this trend to increasing greenhouse gas forcing, given that models simulate a trend of this sign and magnitude in their forced response. We also felt that this weakening could be related to the overall weakening of the convective mass exchange in the tropical atmosphere between the surface boundary layer and the deeper troposphere, a weakening that is expected to accompany warming (post #52). Understandably, the extension of this record since 2005 has led others to cast doubt on this attribution. 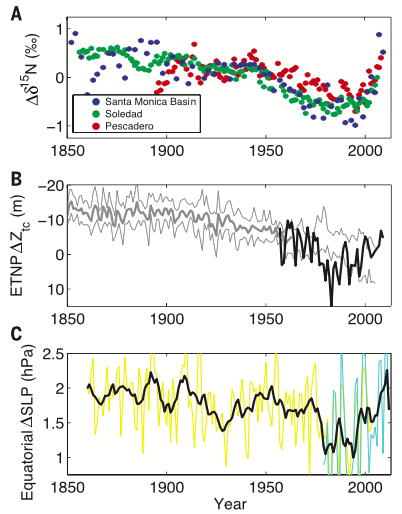 Given the emphasis on quasi-periodic variability in the Pacific, the 15N figure from Deutsch et al caught my eye. But my comfort level in talking about proxies is pretty low (and as a result I have pestered more colleagues than usual while writing this post), and perhaps I am reading too much into it. How unique an event is the recent strengthening of the trades? The coincidence between the slow weakening trend that preceded it and the response expected from increasing greenhouse gases suggests that there may be something distinctive going on (post #45 expands on this possibility a bit). Or is this just a rather big instance of run-of-the-mill background variability? This is likely a significant avenue to explore. The other measure and proxy measure is that of ENSO. A shift apparently occurs around 1980, but prior to that the oscillations are coherent over a long time span — using coral proxy records dating back to 1650. H. Astudillo, R. Abarca-del-Rio, and F. Borotto, “Long-term non-linear predictability of ENSO events over the 20th century,” arXiv preprint arXiv:1506.04066, 2015. Thank you for posting about this very important and interesting issue. May I raise a few queries? I likewise know little about the proxies, but isn’t the most extreme, blue, series in figure A a bit far from the equator (at 33 N) to be very relevant to the argument? Looking at your second figure, I wouldn’t say that a long term downward trend was present until the mid/late 1990s. To me, it looks as if values largely fluctuated until the mid/late 1970s (when the “great Pacific climate shift” occurred), then plummeted and fluctuated again until the late 1990s when they recovered sharply. Although it looks as if there was a slight downward trend from 1860 to ~1975, I believe average values were as low in the 1850s as in the 20 years after 1975. Also, regarding the fact that most AOGCMs simulate a decreasing zonal tropical overturning (Walker) circulation, may I ask what you think of the Stechmann and Ogrosky (2014) paper: The Walker circulation, diabatic heating and outgoing longwave radiation (GRL)? It argues that models erroneously model the circualtion using strong damping, and finds no trend in the Walker circulation over 1980-2010. I tried to be careful in not stating that the eastern boundary upwelling is driven exclusively by the tropical trade winds. I am thinking of a picture in which the multi-decadal variations in North Pacific and equatorial Pacific winds are varying coherently enough that it does not matter much which mix of winds at different locations across the basin generates the eastern boundary upwelling. The Sandeep et al paper is very helpful and nicely lays out in their introduction many of the conflicting interpretations of the data and the models regarding trends in the Walker circulation — emphasizing to me the potential value of clean proxies. As for the connection to the reduction in the vertical mass exchange in the troposphere associated with warming — my picture is very simple. Suppose there are 6 units of convective mass flux in the west Pacific and 4 in the east Pacific, driving 6-4 = 2 units of circulation. If there is a uniform 50% reduction in mass flux, we would have 3 in the west and 2 in the east, or 3-2 = 1 unit of circulation. Btu if, for other reasons, there is a redistribution of the 5 units of convection we now have to work with, say with 4 in the west and 1 in the east, then we have 3 units of circulation. The uniform proportional reduction is just a null hypothesis, in the absence of any compelling reasons to expect a lot of redistribution. But it certainly does not prove that the circulation must decrease in strength. The fact that mass flux and Walker cell strength correlate less well, or hardly at all, in control simulations compared to the full coupled GCMs is consistent with the intuitive idea that there is a lot more spatial redistribution of convection in the internal variability than in the modeled forced response to warming. Some of the other results in Sandeep et al depend on their decomposition into ENSO and non-ESNSO components of the variability which I would need to look at again. The paper by Stechmann and Ogrosky refers to a specific simple steady model of the Walker circulation and whether damping of some kind is helpful in such a model. There is an extensive literature in which the time mean tropical circulation is simulated with linear steady state models, going back to the classic 1980 paper of Adrian Gill. In their comment on erroneously strong damping they are, I think, referring to other simple steady state models, not GCMs. This has no bearing that I can see regarding assumptions underlying GCMs. I would have to be with Nic here. Looking at the two graphs you present together what you see is most of the past 150 years have high(ish) data points (with some variability). But with an abnormally low period, roughly 1970s to 1990s. In that context rather than looking for explanations for why the warming rates is subdued during the hiatus what we should be drawn to is alternative explanations for why the warming rate for the late 20th century was so high. If the models are already capturing the trend in winds then presumably they are also capturing the response to this variability and its impact on GMT. In which case the difference between models and obs cant be closed by subtracting this specific process unless you plan on double counting it. Sorry I’m not try to insinuate anything here, I’m just trapped in what seems to be circular arguments. Perhaps I should have been more explicit. Suppose that that there is, in fact, a contribution to the global mean temperature (GMT) that is proportional to this proxy curve (with a negative constant of proportionality). Suppose also that a model’s forced traded wind response in the tropical Pacific resembles the slowly declining portion of this curve but misses the recent upward trend. Then the declining part will presumably be contributing something to the model’s increase in GMT. It’s just part of the mix of factors that influence the model’s transient climate response. If the constant of proportionality is large enough to explain the difference in recent trends between the model and observations then this implies that there will be a modest but not negligible contribution to the model’s TCR due to its El Nino-ish response to warming. Of course there still could be other sources of non-monotoniciity in the GMT on decadal time scale,s such as variations in the Atlantic overturning. that work in ways that do not involve the tropical Pacific. I don’t see any circularity in any of this. Eyeballing Figure 1, there’s a rough trend of -0.1 per mille per decade from 1950 to 2000 followed by a reversal of around +1 per mille per decade. If there were some linear relationship between this proxy and a contribution to surface air temperature trends, then the recent reversal would have had an effect 5-10 times greater in magnitude than the previous 50-year trend. For surface temperatures beginning in 1997, 1998 or 2000 (random selection of possible start dates for this effect), the best estimate of warming trend ranges from about +0.09 C/decade (HadCRUT4, 1997 start) to +0.14 C/decade (Karl et al, kriged, 2000 start). The confidence intervals are quite wide so interpretation must be limited, but it seems that the most drastic change observed in those proxies over 150 years was, at best, enough to slow decade-scale warming rates a bit. England et al. calculated that the trade wind strengthening reduced surface warming by about 0.1 C. If the trades continued at their 2012 strength (which was unprecedented in their 100-year record) then their cooling effect would stabilise and the expected warming trends would resume but with absolute temperature rise staying about 0.1 C below where it would otherwise be. I don’t see much evidence in England et al. or from the proxies in this post to suggest that they’ve played a huge role in the full-period trend. Given that the expected forced response is for a weakening of the trades then the continued strengthening that would be required to get a lower future warming rates would surprise me, as someone looking in from outside the whole ocean/dynamics area.